Boost your career with the Executive Master of European and International Business Law of the University of St.Gallen. The Executive M.B.L.-HSG - recently listed among the most innovative law programs by the Financial Times - combines advantages of an LL.M and an MBA, is part-time, has study locations in Europe, the U.S. and Asia and is taught in English. Our Executive Master of European and International Business Law, E.M.B.L.-HSG of the University of St.Gallen provides you with a generalist education in European and International business law, WTO and IP law, Chinese and Japanese business law, IT and energy law, competition law and policy, M&A, finance, taxation and corporate governance, as well as procedure. Knowledge in this area is not only essential for lawyers, but also for all executives involved in decision making. Our graduates are much sought-after in the legal, business, consulting and administrative professions. The Executive M.B.L.-HSG is taught in English. It functions as a flying classroom and disposes of a global faculty which consists of European, American, Chinese and Japanese professors, lawyers, in-house counsel, judges, politicians, officials and economists from business and academia. The program starts in St. Gallen and then makes a trip around the world with the destinations Zurich (Finance), Frankfurt (M&A), Luxembourg (Procedure), Brussels (Competition Law), Geneva (Law, Lobbying & Public Affairs), New York (International Taxation), Cambridge, MA (Negotiation), Shanghai (Law & Business in China), Tokyo (Law & Business in Japan) and Austin, TX (Energy & IT Law). Beside top universities like NYU, Harvard, University of Texas, Fudan (China) and Waseda (Japan), cooperation partners include significant law firms such as Freshfields, Norton Rose Fulbright and White & Case. Due to the balanced mix of academic and practical knowledge, candidates can apply their new know-how directly in their daily work. This creates an immediate added value, also for the employer. The Executive M.B.L.-GSF has educated more than 600 graduates from 31 countries in the first 20 years of its existence. The University of St.Gallen is accredited by the European Quality Improvement System (EQUIS) and the American Association to Advance Collegiate Schools of Business (AACSB). 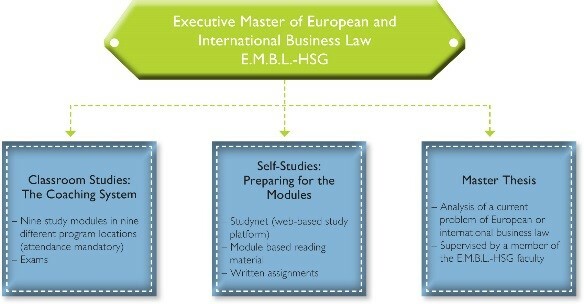 Holders of the <Executive Master of European and International Business Law E.M.B.L.-HSG> benefit from the excellent quality of the University of St. Gallen and from the reputation that HSG graduates enjoy in the marketplace. The Executive M.B.L.-HSG has recently been mentioned as one of the most innovative law programs worldwide by the Financial Times.